The power management control ECU receives an engine speed signal and information that indicates whether the engine is running or not. It receives the engine speed signal from the ECM via a direct line, and the information about whether the engine is running is received from the ECM via CAN. If the information sent using these 2 methods is inconsistent, this DTC will be stored. 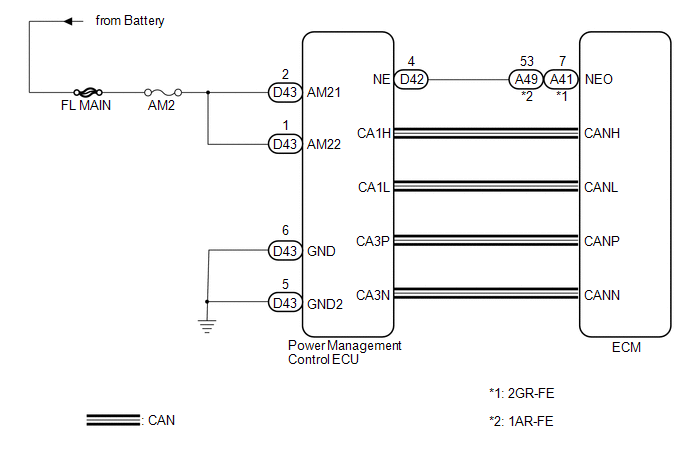 Information received by the power management control ECU via a direct line from the ECM and information received from the ECM via CAN is inconsistent. Check the connector connection to the terminal to make sure that there is no abnormality such as a loose connection, deformation, etc. (a) Disconnect the A41 connector from the ECM. (e) Read the Data List according to the value(s) in the Techstream. Stop (engine is stopped) and Run (steering lock is locked) appear on the screen. (a) Reconnect the D42 connector to the power management control ECU. (b) Reconnect the A41 connector to the ECM. 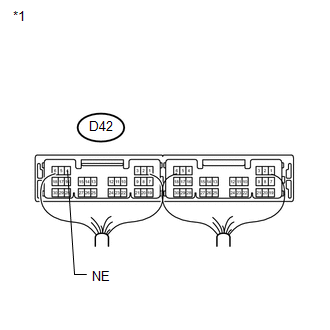 (c) Connect a D42-4 (NE) and body ground. (d) Check for pulses according to the condition(s) in the table below.